For more than 23 years, SCOPE has worked with strategic partners to create the kind of jobs our communities need—jobs that pay a living wage, offer an opportunity to build towards a career, and uplift the quality of life in South LA. 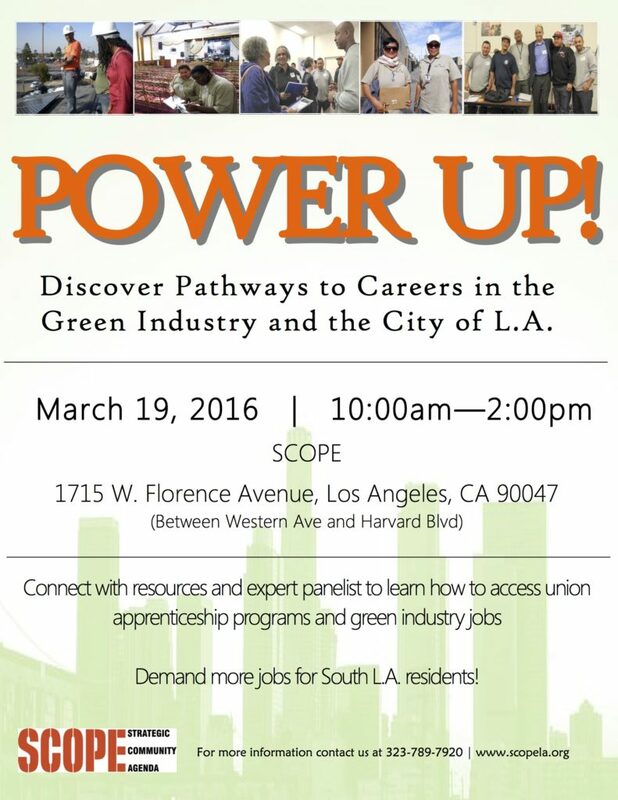 After years of significant wins and the development of successful job models—including IBEW Local 18’s Utility Pre-Craft Trainee program at LADWP and the City of LA’s recent commitment to expand its workforce by 5,000 positions by 2017—SCOPE and our allies are working to better prepare our communities for these kinds of job and training opportunities. This month, SCOPE held a resource fair to connect individuals with local organizations, unions and public agencies that offer training resources and apprenticeship programs to workers of all skill levels. The event included a discussion led by representatives from the City of LA, the Coalition of City Unions, and LA Trade Tech that walked participants through the City’s existing hiring processes and proposed career pipeline for entry-level workers. At a second panel discussion, SCOPE member and newly hired LADWP Steam Plant Assistant, Abraham Hernandez, shared his experience going from zero work experience to being trained and hired at the Utility. SCOPE has a track record of building broad alliances to advocate for and develop training and job placement programs that target low-income job seekers. Our research has helped identify: 1) key growth sectors in the LA region; and 2) common barriers to employment in career path jobs in disadvantaged communities. The jobs models that SCOPE and our strategic labor and community partners have co-developed, including the City Jobs Program, the Green Retrofit and Workforce Program, and Utility Pre-Craft Trainee Program, have set the standard for earn-while-you-learn training and job placement programs within the green job and public sectors.